Three players: Brian Bradburn, Sue Gurr and Tommy Werry will make their representative debut for Wellington in the Senior Tri-Star in Christchurch next month. The Wellington team is: Brian Bradburn (Silverstream), Clare Bradburn (Silverstream), Sue Gurr (Wanganui East), Bob McCarthy (Otaki), Margaret Mordecai (Otaki) and Tommy Werry (Park Avenue). Results from Day One of the 2012 Inter-club competition are now available. Masterton convincingly won their first defence of the Jacques Cochonnet Trophy when the defeated Manawatu 8 games to 1. Masterton's next defence is away to Park Avenue. Triples: John Clark/Graeme Morris/Ralph Priddle vs. Derek Cooper/Jean Signal/Claudia Thompson 13-8, 13-2, 13-3. Brian Smith has now played for four different clubs (Upper Hutt, Khandallah, Silverstream and Masterton) in Jacques Cochonnet matches. Two players have represented three clubs: Tony Chin (Park Avenue, Khandallah, Windy Hills) and Dirk Winnie (Upper Hutt, Khandallah, Park Avenue). Michael Rocks and Peter van Heusden have both played over 100 games for a single club (Khandallah). The early records of the competition are incomplete. If anyone can provide some of the missing details or other interesting facts, please send them in. PNZ has announced the Open Trans-Tasman teams to play against Australia in Wanganui (14 & 15 April). Allan Fletcher (Herne Bay), David Lippard (Herne Bay), Andre Noel (Vikings), Michael Rocks (Khandallah), Richard Swaney (Herne Bay), Georgio Vakauta (Vikings). Christian Fouquet (Herne Bay) is the reserve and John Targett (Christchurch) the coach. Sharon Cannon (Bay View), Pam Jenkins (Herne Bay), Barbara Johnston (Masterton), Joanne Lippard (Herne Bay), Christine Strichen (Wanganui East), Claire Wilson (Masterton). Yvonne Futcher (Wanganui East) is the reserve and Selwyn Sainty (Herne Bay) the coach. The Senior teams will be announced after this weekend's selection camp at Khandallah. Robin Anderson, Guy Detot, Eric Doublet, Clifford Edouard, Laurent Fossaert, Pierrot Lubin (Captain). Reserve: Patrick Dufresne. Sue Begley, Doreen Boudan, Kate Mangan (Captain), Jacqueline Nemorin, Libby Sowter, Myrielle Xavier. Reserve: Kim Threadgate. France Blackburn, Adrian Clements, Terry Dando, Alan Sanderson, Antonio Stojsic, David Ward (Captain). Reserve: Jean-Paul Boudan. Joyce Anderson, Helen Bayet (Captain), Irene Callaghan, Fayhe Hide, Valmai Nicholls, Robyn Ryan. Reserve: Dorothy Blackburn. Sixteen teams took part in the tenth annual Upper Hutt Swiss Doubles. 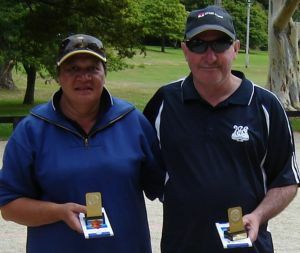 After four rounds, Yvonne Futcher and Tony Simpson were the only undefeated team. A loss in the final round allowed Brian and Claire Bradburn, Fay Doyle and Harl Stevens, and Michael Rocks and Barry Sarney to join them on four wins. However, Yvonne and Tony had done enough to head the others on tie-break. Results from Day Two of the 2012 Inter-club competition are now available. Fourteen teams took part in the WBS Open Triples at Masterton. In the Trophy final, Myles Cowper, Gordon Dykes and Michael Rocks gained their revenge against Bruce Jeffery, Elva and Kelvin Simonsen, who had beaten them in the earlier pool play. The Plate final was won by Bob Bridge, Sharon Cannon and Graeme Morris, who came back from 3-9 down to beat Yvonne Futcher, Barbara Johnston and Christine Strichen. The Bowl, which was played as a round-robin, was won by Joan Miller, Ralph Priddle and Anna Simms. PNZ has announced the Senior Trans-Tasman teams to play against Australia in Wanganui (14 & 15 April). Clive Bartleet (Vikings), Bob Bridge (Hibiscus Coast), Charles Brock (Vikings), Neville Frost (Caversham), Graeme Morris (Masterton), Ralph Priddle (Masterton). Bob McCarthy (Otaki) is the reserve. Marilyn Bunce (Alexandra), Janet Goodin (Caversham), Shirley MacDonald (Horowhenua), Margaret Maher (Northcote), Shirley Selwyn (Wanganui East), Ann Shields (Epsom). Margaret Penny (Northcote) is the reserve. Clive Bartleet, Janet Goodin and Shirley MacDonald will be representing New Zealand for the first time.